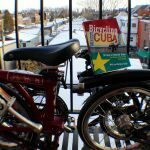 We took the Bromptons to their first event today, the Climate Change Film Festival put on by Our Horizon. 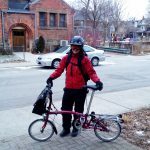 We watched “Solar Taxi” about a guy who builds a solar powered car and drives it around the world, and “Spoke” which examines cycling as a viable form of transportation while addressing the infrastructure enhancements needed to improve Toronto’s quality of life. The first movie inspired me to do something similarly awesome. The second made me sad that Toronto’s cycling infrastructure is so far behind what it could be. More on that some other time.